@ReallyVirtual (Sohaib Athar). "Helicopter hovering above Abbottabad at 1AM is a rare event." Twitter, 4 Jan. 2013, 3:58 p.m. twitter.com/reallyvirtual/status/64780730286358528?lang=en. Note: Write out the actual Tweet in the citation and keep spelling and grammar the same as in the original, even if there are errors. When quoting the Tweet, beside grammatical and spelling errors in the original Tweet, write [sic] in square brackets to indicate the errors are not your own. For example, if the Tweet was "It isn't you're fault the media is violent", write: "It isn't you're [sic] fault the media is violent." Creator's Last Name, First Name (Username). "Title of Digital Image." Title of Website, Other Contributors, Version, Number, Publisher/Platform, Date of Publication, URL. Accessed date. mstornadox. "Beatrice Took a Photo." Yoyodyne Industries, Tumblr, 5 Nov. 2014, mstornadox.tumblr.com/post/101904587855/beatrice-took-a-photo. Accessed 9 Nov. 2017. Note: The username was used in place of the real name. Fig. 4. 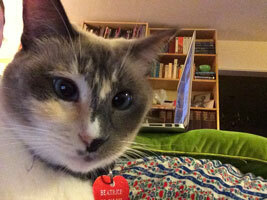 Cat selfie from: mstornadox "Beatrice Took a Photo." Yoyodyne Industries, Tumblr, 5 Nov. 2014, mstornadox.tumblr.com/post/101904587855/beatrice-took-a-photo. Accessed 9 Nov. 2017.